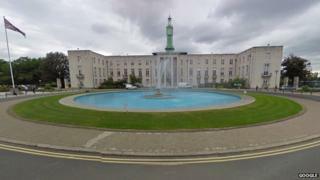 An east London council has admitted contravening health and safety guidelines by failing to control employees' exposure to asbestos in their town hall basement. Waltham Forest council pleaded guilty to charges under the Health and Safety at Work Act and the Control of Asbestos regulations. The council said it "should have done more in the past" to manage safety. Unison has called on the council's chief executive to resign. The case was brought by the Health and Safety Executive and related to two incidents in November 2006 and two more in January 2009. The hearing at Westminster Magistrates' Court took place on Monday and has been transferred to Southwark Crown Court for sentencing on 2 February. The union said the issue was discovered when a local resident was refused access to requested files because of the risk of exposure to asbestos dust. Unison branch Secretary Dave Knight said the council failed to protect people from potential exposure to "deadly asbestos." He said: "We are appalled that our employer should show such scant regard for the health and safety of people who work in and use the Town Hall." "The case demonstrates a lack of concern for employees and contractors and anyone else who had cause to visit the Town Hall basement, and it is for this reason that we call upon the chief executive of Waltham Forest Council to tender his resignation." A spokesperson for Waltham Forest council said: "This issue dates back to 2002, and we completely accept that the council should have done more in the past to manage the health and safety of our buildings. We accepted responsibility at court. "In 2012 a fresh asbestos survey indicated the problem, and we have been working with the Health and Safety Executive to make sure that nothing like this happens in the future." Asbestos remedial works were carried out at the town hall basement in 2012 and other buildings have been monitored, the council said.